Here is an article from the British Royal Mint about an upcoming change to their coins. This year, for the first time since decimalisation, the legal tender coins of the United Kingdom will undergo a major design change. In Spring, the Royal Mint will reveal to the nation, the new designs on its coinage, from the 1p to £1. The new reverse designs are a contemporary take on traditional heraldry reflecting the nation’s rich history. To mark this major numismatic milestone and to commemorate the reverse designs that have served Britain for many years, the Royal Mint has produced three magnificent limited-edition coin collections. Prior to the launch, we will take a look back at the coinage to which we have all become accustomed too. On 1 March 1966 the Chancellor of the Exchequer, James Callaghan, announced that the centuries-old system of 12 pennies to the shilling and 20 shillings to the pound would be replaced by a decimal currency system in which the pound was to be divided into 100 units. Recognising the enormity of a change that would affect every business and household in the country, the government proposed a five-year preparatory period before the official changeover. The introduction of the new decimal series of coins was no easy task 40 years ago. From settling the dimensions of the coins, to the creation of the designs and their production by the Royal Mint it was a mammoth undertaking. Not only did the different denominations need to be readily distinguishable by sight and touch from each other, they also needed to avoid being confused with existing coins of the pre-decimal system. As for their designs, a new portrait of the Queen by Arnold Machin RA had already been prepared and approved, while for the reverse designs it was announced in November 1966 that a public competition would be arranged. More than 80 artists took part and, from the 900 or so designs that were received, a series by Christopher Ironside was eventually approved, his designs drawing praise for the ‘lack of clutter’, a requirement that had been stressed in the creative brief. Christopher Ironside’s winning designs for the 1/2p, 1p, 2p, 5p and 10p pieces were largely heraldic in theme. The 1p coin features the crowned portcullis, which was first issued on 15 February 1971, the day British currency was officially decimalised. The 2p coin features the Badge of the Prince of Wales, which includes the motto ICH DIEN meaning ‘I serve’. The 5p coin was introduced in 1968 in preparation for decimalisation and the coin’s reverse features the Scottish emblem of the crowned thistle. A smaller version of the coin was subsequently introduced in 1990. The 10p coin was also first released into circulation in 1968 to replace the florin. As part of the ongoing review of the coinage, a smaller version was introduced in 1992, although the reverse design of the crowned lion remained unchanged. The 20p coin, featuring a much-loved reverse design by William Gardner was introduced in 1982 and incorporates a crowned Tudor rose. The 50p piece bears Christopher Ironside’s definition of Britannia, a symbol that has graced British coins for over 300 years. As with the 5p and 10p, a smaller version of this coin was introduced in 1997. The £1 coin, which was first introduced in 1983, bears a design by former Royal Mint Chief Engraver, Eric Sewell, and features the Royal Coat of Arms. The coin also features 100 beads around the circumference of the reverse representing each penny in the pound. A whole generation has since grown up with decimal currency and the traditional nature of the reverse designs. This year, however, another milestone in the history of the coinage will be reached when the reverse designs of the 1p, 2p, 5p, 10p, 20p, 50p and £1 are to change. 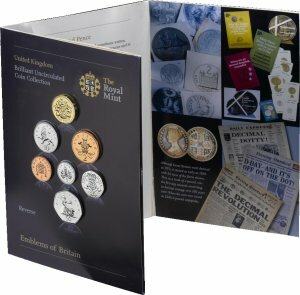 For further information on this historic Numismatic event, and for your opportunity to own a complete collection of the last of the old coin designs, visit http://www.royalmint.com/emblems/home.html.